This year, due to various circumstances, which includes the lack of good food near work, and the rising prices of food, especially at the hawkers, I decided to make it a point to bring my lunches to work. I used to a while ago, but as with a lot of things, it didn’t last as long as it should. Naturally, if you too pack lunch to work, I’d love to hear your ideas! If you want to start, I hope this helps! Why Pack your own lunch? Why not? It takes a little more effort, because you do have to plan your meals a little, but it’s healthier, not because you eat salads, but because you know what goes into your food, and because you have portion control. Previously, when I was packing my lunches, I found that it actually helped me lose and maintain my weight. Depending on the containers you use, you will find that it’s easy to control your portions, and eat a better variety of food. If you eat out, you may find yourself wolfing down a bowl of noodles only to realise that it’s 90% noodles, with just a few slivers of meat and vegetables. Make your own and you can reverse that, and that’s healthier and better for you and your weight. But I don’t like eating my food cold! You don’t have to. You can bring hot food in thermos containers that will keep your food hot, or at least warm until it’s time to dig in. It took me a while to get the concept but now I do, it’s a cinch! I use a variety of containers to keep my food hot and here is a non-exhaustible list. I don’t know how I ended up with 2 similar sets but I did! LOL It is basically a thermos jar that comes with 3 containers within. The containers look quite small but the trick is to pack them well, and you’d be surprised at how much fits in there. 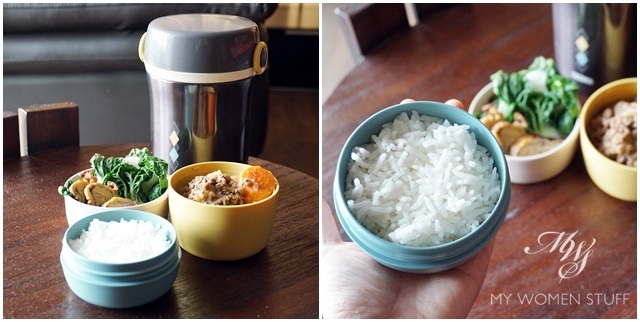 This is tailored for Japanese style bento lunches, so the concept is to use the largest container for rice, the screw top container for soup and the smallest container for your mains. Because I don’t eat a lot of rice but a lot of protein and vegetables, I switch the portion sizes around. Just use it for whatever suits your eating style. This is a new acquisition and I’m very pleased with this because I like to bring soups to work. It comes in stainless steel or even in colours and different designs but it’s a wide-mouthed jar with a cover that doubles up as a small bowl. I saw my baby nephew’s food kept in it and that’s how I knew it would work. I use this for soups, porridge (congee), stews or anything liquid. If I’m serving soup or stew with noodles or pasta or rice, I bring the carbs on the side in a separate container. This is fairly large so it’s most ideal for bringing food for more than 1 person. The concept of a thermal cooker is to use the thermal heat to cook your food, so you can technically have freshly cooked food for lunch. Before I bought my Thermos food jar, I used this to carry hot food and soups to work. Mine has a shallow tray at the top that I can use to boil up my rice so I get piping hot, freshly cooked rice right in the comfort of my office. But if you’re just feeding 1 person, it’s too large and bulky. You can buy these thermal/vacuum containers in the household department of most department stores locally (Malaysia and Singapore) and there are many different brands (mostly Japanese) but overseas I’m not sure where you can get them, but I’m sure you can find some information or online stores selling these. Wait till they go on sale or Best Buy, which is often for best deals. I’ve seen the Thermos sets go for under RM150 and I bought the Thermos Food Jar for about RM64. Whatever thermos flask you use (I use Thermos generically for any vacuum flask, not necessarily the Thermos brand although that’s one I trust and use), the trick to keeping your food HOT until lunch is simple. Before putting your food/containers in the flask, rinse it out with boiling/hot water first or put hot water inside for a few minutes. While my food is heating in the morning, I boil up some water and pour it in, swirl it about or keep it in with the cover on for a few minutes, and then pour it out. I do this just before putting in the containers/food and this keeps your food nicely hot. It won’t be piping hot, but it’ll be hot enough to enjoy. You can also use your Thermos to keep your food cold, so if it’s a particularly hot day and you want something cold then it’ll do too. When I bring food that doesn’t need to stay warm, or wraps or sandwiches, I use a variety of containers that I’ve accumulated over the years. If you like, you can buy bento lunchboxes from places like Daiso where you can get really cute bento stuff as well. I’ve gone through all that, and I can’t do cute or small (I need my food remember?). So, I just do practical and Lock & Lock makes practical boxes that I can use on a daily basis to store food in my fridge as well. If you want to bring hot food, don’t bother with the so-called insulated bags. I’ve tried them and nothing works as well as a vacuum jar. Yes, it takes effort to prepare a packed lunch, I agree. But all you really need is to plan ahead a little and I have some tips for you. If you cook dinner, cook a little extra and set it aside for your lunch. In the morning, heat it up in the microwave or in a pot, fill your food containers and you’re good to go. If you eat out, you can always pack leftovers or order a little extra to bring to work the next day. No one said packed lunches must be cooked at home right? 😉 I sometimes cheat this way too and just cook rice or noodles to go with the food. You don’t need to make your lunches look cute. I don’t make cute lunches, if you look at my photos. Sure, there are tons of bento blogs out there where their bento lunches look like pieces of art. Mine don’t. They’re just serviceable food, and really, that’s all you need. Steam to heat or microwave in the morning. You can put your food to heat while you are dressing or putting on your makeup. That’s what I do. Stick the food in the steamer (I have a microwave but prefer not to use it for heating as I don’t feel it gets food hot enough and heated properly) and get dressed. By the time I’m ready, the food is ready and I just scoop them into the containers, wash up and go. If you don’t have time in the morning, then prepare it the day before. Some foods can be prepared the day before. If you make salads, wash them and pack them the night before and keep them in your fridge. You can fry rice the night before, or prepare stews and soups. When working with leftovers, if your office has a microwave, then heat it at work. If it doesn’t (like me) then invest in some thermos flasks and use the microwave if you like it quick, or use a pot or steamer like I do. I’ve seen some people prep their lunches ahead for the whole week on a weekend. I don’t because I have my doubts about freshness of my food kept that long even if in the fridge. If I cook ahead, I freeze and reheat in the morning. I rarely, if ever, pack my food more than 1 day in advance. Of course if you don’t have doubts like I do a weekly food prep is an option. I may plan ahead but I don’t prep ahead. I used to bring salads to work for lunch, thinking they were easy and quick, until I realised that I wasn’t a salad type of girl and it made me hungrier because I wasn’t getting filled up. I like my food and I like them hearty and in generous portions and preferably warm. I like pastas and rice and fried rice and fried chicken and I’m just not really into the whole “clean eating” trend, although I try. I just like food, period! So, I make and bring food I like. If I feel like having fried chicken, I make fried chicken. If I feel like fried rice, I make fried rice or pasta. The only thing I don’t really eat is processed food, so I don’t eat a lot of sausages or cured meats or frozen prepared food, preferring to eat whole food. Salads – wash the leaves, dry them and keep them in the fridge the night before. Bring your dressing separately and dress your salads only when you’re going to eat it so it doesn’t get soggy. I use these silicone cups you can get at Daiso (4 for RM5) to hold your dressing. I used to use little bottles (also available at Daiso) but they’re too hard to clean so I prefer these cups. 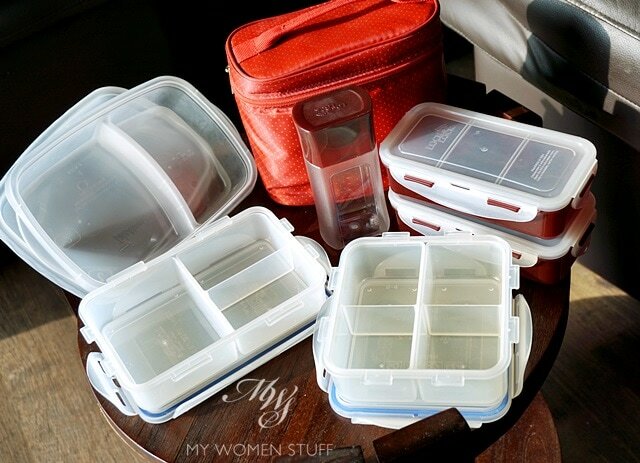 You can also use them to separate your food in your bento boxes if you like. Stews – These are easy to cook the day before or on the weekend and to freeze into single portions for use during the week. Soups – Ditto, easy to make the day before or on the weekend and to freeze. Porridge – This would be rice congee. It can be a one dish meal with meat and vegetables cooked in it and it’s comforting especially if it’s a cold or rainy day. Fried Rice – A great way to use up leftover rice and to make a quick meal. Wraps and sandwiches – Traditional packed lunch food. There is a skill involved to avoid the bread getting soggy, which can include you bringing the filling separately but experiment and you’ll get there. I don’t eat a lot of bread, so I prefer wraps where the dough is thinner. The only thing I don’t bring is fish or seafood. The potential for spoilage is high and it smells, which doesn’t make it pleasant for others in the office 😛 So I keep my fish to eat at home. But if you don’t mind then it’s always an option. Won’t it make me anti-social? 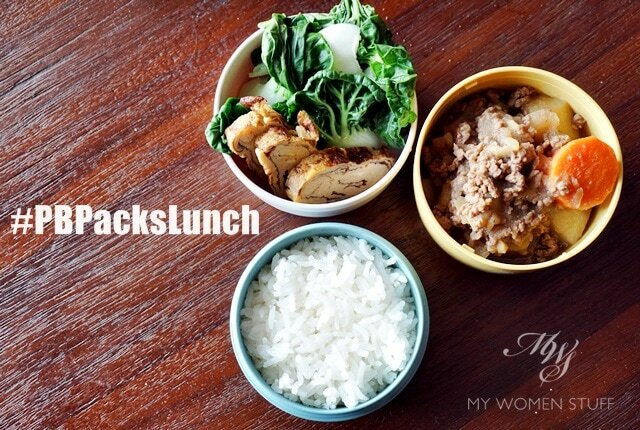 Ready to join me on #PBMadeMePackLunch? Do you bring a packed lunch? PREVIOUS POST: Your Say: Do you follow the mascara-wearing beauty rule or don’t you? I really appreciate the tips about keeping food warm. thank you for inspiring me with this post. 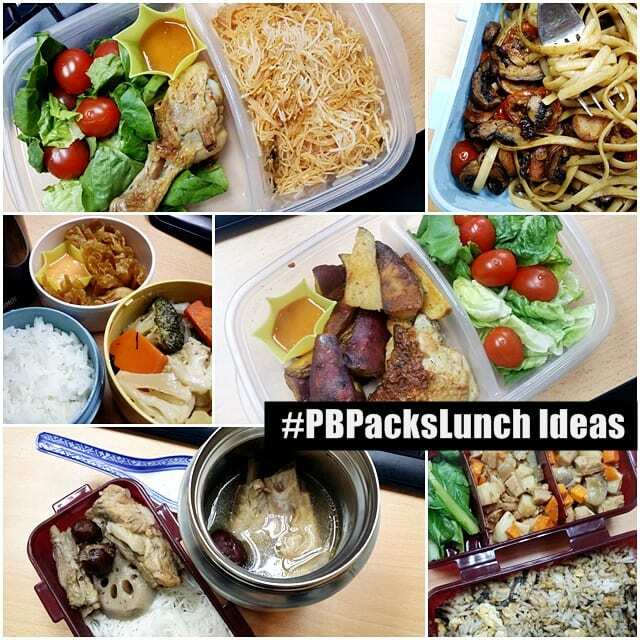 i always saw #PBPackslunch on instagram and i kept on asking myself “when are you going to start doing that?”. food are getting expensive and they’re not even yummy at my place. i’ll make sure this weekend i get my meal plan sorted out and prepare what i need to start 🙂 wish me luck! I’ve been packing lunch for quite some time. It was a spin off from packing my kids’ lunch boxes for school the night before. (Could never bring myself to wake up early to prep meals in the morning) The kids’ lunch boxes contains normally, a sandwich (ham or tuna or cheese or egg salad or PBJ or the rare indulgence, smoked salmon), a fun snack (cake/sausages and recently, home baked (which is an unbelievable achievement for me considering my very highly dubious baking skills) breakfast muffins and cut fruits or a salad. From there, I added on packing my own lunches. It started with salads – vegies or fruit but you are right, somehow, they were not satisfying. So I ventured into breads, leftover dishes (but without rice) (from weekly dinners with my parents = home cooked food) and soups – and more soups (leftover from meals or from a crock pot brewed on Sundays). I bring them in all kinds of containers – the thermos jar/pots, the lock and lock containers and even the disposable plastic boxes. I used to be lazy – I would microwave and eat straight from the disposable boxes but I got nagged at (in a good way) that it’s not healthy – so I diligently transfer the food into proper microwavable porcelain bowls and heat them. My latest venture is poaching eggs for my toast using a mug filled with water and the microwave. Scrambling eggs in a mug will be next. I find that I save a lot of time lunching in. I work through lunch and get my food zapped (aka heated up) after the main lunch crowd in the office are done in the pantry. Not to mention saving $$ and I feel my meals are a lot healthier and less fattening. To add to that, after being in a place for so long, one gets totally tired of the same old same old food joints around. Gosh, your kids get a great lunch! Kudos to you 😀 But you agree right? Somehow, eating salads and fruits feel like a snack to me so my tummy tells me that it’s not a meal. If I do a salad, I have to do lots of protein on the side, so a piece of chicken and an egg usually fills that gap. Having a microwave in the pantry is always a boon. Saves you a lot of time too! Packed lunches are the bane of my working day existance and I must say that the thing that actually inspired this was your post on pretty lunch bags (https://www.mywomenstuff.com/2008/11/fashionable-stylish-lunch-totes/)!! Of course having only crap hospital food from the hospital cafeteria was one of the reasons as well, but i must say that the cute lunch bags were what kept me bringing lunch to work until my lunch tote has become my signature work arsenal. I have 2 Built NY lunch totes in heavy rotation, they expand beautifully to accomodate my water bottle, lunch box & fruits. I did stop for a while because of the anti social factor (your post does hit so close to the heart!!) but i restarted after too many lunches out started to pile on the calories. Oh I never ended up getting those bags! LOL I only use what I have now and it’s great to know that you’ve found a way to stay motivated to pack your lunches to work 🙂 Pretty things always help don’t they? 😉 But yes, I’ve also noticed how eating out can make the weight pile on quite slowly but surely. It’s all that oil, especially in our local food, I swear! We cook from scratch most nights and always make some extra for my lunch the next day. It’s healthier and money saving. (Win!). Work has a microwave so reheating is easy. I would tag you on Instragram, but am too ashamed of my ratty old lunch box! Your lunches look lovely! Great post and sharing PB! When I first started to work, my mum used to pack me those complete lunch meals with rice 2-3 scaled down portion dishes. Mum being a traditional woman didn’t consider investing in fancy or practical containers. So I’ll be bringing multiple food containers. It frustrated me to be honest because there’s so much washing to be done at work. Thankfully we had a great pantry well equipped with cutleries, fridge and microwave at work…until some food sensitivity issues like was it pork free came about. Anyhow, I had a lot of other friends who would join me hence we are known as the pantry gang. Lol. We inspired some other to pack their food and join us dine and chat ala Oprah at lunch. We also shared and exchanged food, fruits and desserts! The setback was instead of focussing on the positive outcome such as savings in terms of time and better health and food quality, I do get sarcastic remarks like I’m antisocial or skimping to be on my way to be a millionaire. Yes, totally absurd. Mum cooks excess the night before for dinner and for our lunch the next day hence not too much effort other than heating up and packing it diligently. I beg to differ that home packed lunches are cheaper – it may not or even if it’s the same price, at least you knew you’ve washed the vegetables clean or use decent quality cooking oil. Fast forward to my current work life and office setting, I no longer bring my extensive packed lunch. Eyes would follow, mouths would comment. I bring simple home made bread sandwiches 🙂 easy and fast. I love your Instagram installments of your packed lunch. They looked so good ( especially the soup and mee hoon) and I’m sure it’s yummy in tummy 🙂 thanks for sharing this and it shows that if it’s a good practice for the right reasons and benefits, naturally it’s the right thing to do. I have always had packed lunch. At first because mom insisted and it was just the way things were. She was a nurse and would get up at 5 am to make lunch for everyone. She would pack a lunch of nasi goreng or sandwiches for me and cook a couple of dishes for my pops for when he came home for lunch. This was way back in the 70s when people can and normally go home for lunch. Mom on the other hand worked too far away and would have to bring her lunch. And then i grew up and pack lunch in college was not cool. My waist line grew as i made eating out a habit. Teh tarik that washed down everything was the killer. Somewhere along the way, I moved out and stayed on my own. The habit of eating home most meals have always been in me as my father would never ever eat out. And i was somewhat capable in the kitchen. So i cooked my dinner, always in bigger portions. I started taking the left overs to work alternating with sandwiches. As of 10 years ago, packed lunch became the norm for me unless I am expecting visitors, entertaining and when i travel. Packed lunch also became really convenient as I can keep on working and there is no need to ‘pick up where i left off’. Yes that does not sound right as i do not take a ‘break’ but that is how it is. I think packed lunch is a no brainer. From what i gather, lunch out is getting to be pretty expensive even when bought from the dinky stall and who can tell what has gone in. The thing is packed lunch can be cheaper on the pockets and you know what has gone in. What I do not understand is that many people moan about cost of living and how expensive lunch and breakfast can be, but can never be motivated enough to consider the idea of packed lunch. Yes I was there, pack lunch did not look cool in college, but hey, have we not got past that? I am not a health freak and do not understand the “eat clean” mantra. Don’t we all choose to eat clean food? But i have taken to making salads (because at this side of my 40s i now want my vegs). The thing is the salads are loaded with chicken breast or boiled eggs or salmon and sprinkled with parmesan. Also love avocados, strawberries or garbanzo beans thrown in, not all at the same time if that sounded too much of a glutton. I was stoked when I saw the little daiso container you use to put the dressing in and would give that a try. Currently i use the 3 section tupperware container for the salad, dressing and the protein. Soups sounds like a great idea but I have not gotten that right. I bought a La gourmet soup thermos a bunch of years ago and that did not come out good. It did not keep the soup as hot as I want it to be and it leaked. Now its sitting in the cabinet waiting to be thrown out. Once a while my husband use it to take his coffee when we go out. He does not care about keeping his coffee super hot. Your thermos at $64 sounds tempting. Then again, perhaps i should listen to my mom’s mantra that is ” eat to live, rather than live to eat”. But the latter is, oh, so much fun. In this country it used to be so easy to lunch out because really, back in the good old days, it was roughly RM5 for a street food dish and a tea (with even a bit of change leftover sometimes) but nowadays, I’ve really felt that prices have crept up considerably and even street food is catching up with having a meal in an air-conditioned mall. I never thought I’d see the day when my bowl of pan mee would cost me more than a Pizza Hut pizza and it finally has! Fortunately for me, I have the amenities at work to whip up a decent lunch on site, so nowadays it’s just about taking the initiative. I’ve never really been one of those ‘ladies who lunch’ and lunch for me has never been an indulgence but a meal meant to be wolfed down and to get back to work on but I lately have been resorting to a healthy but bland option of oatmeal mixed with water and sprinkled with some bits of date or raisins. It’s super healthy and I really want to make it part of my daily diet because I want to offset some of the rubbish I have been ingesting for the other meals in my life. Fingers crossed that it sticks! I’ve enjoyed spotting your Packed Lunch series on Insta – keep it up! Came across your blog by chance while googling hermes bag 🙂 and saw this post about packed lunch. I really enjoyed reading it! I\’ve been contemplating to bring packed lunch to the office for a long time now (two years!) because where I am in the netherlands, there is only broodjes (sandwich) and milk available for lunch. Being an asian, I am really having difficulty adapting to this \’lunch culture\’. But you have inspired me to get started! !Thanks for your tips on how to keep food warm! I\’m from Singapore and I didn\’t even realise that you could get the thermal containers from departmental stores in Singapore. Do you mean stores like Isetan? I can\’t wait to go check it out on my next fly back. I am rather curious to know if you eat lunch at your desk? or is there a pantry where you go to for lunch? Because at the office where I\’m at, there is no pantry… most people who bring sandwiches from home for lunch eat at their desk. If I were to bring hot food for lunch, I\’m afraid they might make the office \’smell\’. 😛 Thats one of the reasons why I hesitate to bring packed lunch to work too. Gonna go check out your packed lunch series on insta! Hi Cara, Thank you for sharing your comment and how interesting that you came in for Hermes to stay for packed lunch! LOL 😀 Oh I know how you feel about craving Asian food for lunch. I’ve tried sandwiches and salads but my Asian genes rear their ugly head every so often to compel me to eat rice! 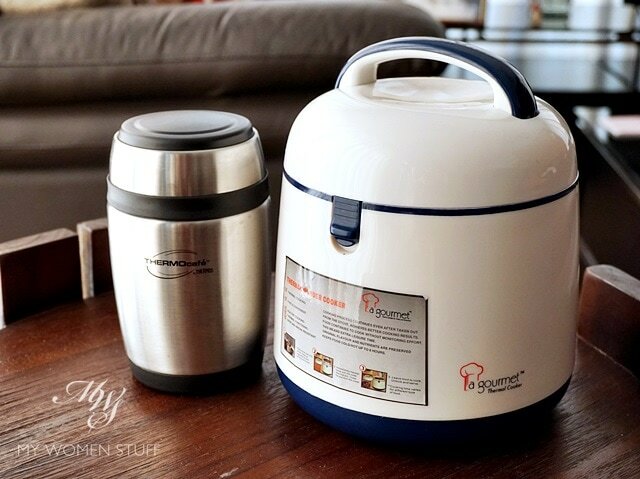 It’s really easy to get these sort of thermal or food containers in Singapore – I’ve seen them in Tangs, Takashimaya and Isetan when I visit, and when they have special fairs their prices are usually quite enticing. I always want to take more home, except that they rarely fit into my luggage! Otherwise, if you want to get them before you go back to Singapore, I think you can get them online from various online stores or ebay. Yes! The funny thing is that I see the same people who are complaining about rising hawker prices buying coffee every day. I wonder if they realise just how much they are spending on just that iced coffee daily? I’m a salad eater – not particularly due to choice but because I can pack my lunch in less than 10 minutes and I hate the queue for the microwave at work. (Plus, our work lunch places are…um…not the best if you want to stay healthy). Sometimes I will bring leftovers, but only on weekends when there’s no microwave queue. I like the idea for soup in the winter though! Your bentos look so good! My main discouragement is that I’m not very good at cooking. But you’re right – it’s so good for portion control! Like me too, I pack lunch daily.. 🙂 yours give me some inspirations.. Thank you !